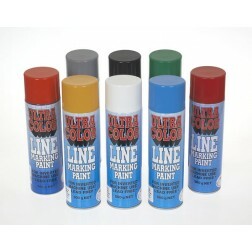 Line Marking Aerosol paint cans available to suit either machine use or hand held application. Available in a wide range of long-lasting lead-free colours. Machine version uses a special T actuator to fit the Ultracolor 4 Wheel Line trolley. Hand held version has a spray through cap for all hand-use applications, including stenciling of disabled parking spaces, pedestrian crossings etc. Used in applications such as Line-Marking, Warehousing and Civil Engineering industries. Note: A Dangerous Goods freight surcharge of $25 + GST will be automatically added to the freight cost on these items.